We recently received a question from a listener about these interesting insects. 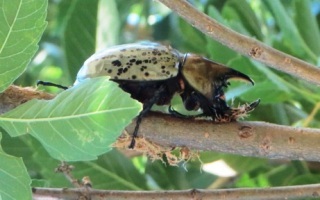 Elaine Wilson from Graford, TX also provided some wonderful photos of these beetles doing more damage than we were aware they did. Enjoy the photos and read the updated data about these beasts. 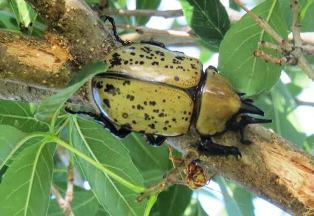 Common names: Rhinoceros beetles, Hercules beetles and Ox beetles. 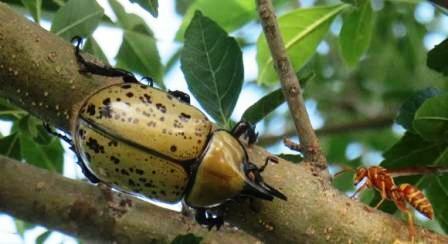 Scientific Name: Order Coleoptera, family Rhinoceros Beetle Family (Scarabaeidae), several species. Size: Adult - up to 2", larva - up to 3”. 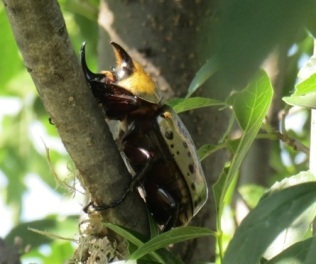 The Eastern Hercules beetle is the largest beetle in the US. Males are slightly larger than the females. 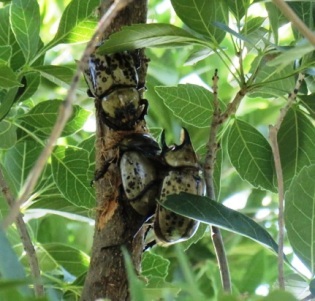 Identification: Very large beetles with horns; males have more prominent horns than the females. Many different sizes and colors. The larvae are huge grub worms. Biology & Life Cycle: Complete metamorphosis. Females deposit eggs into piles of decaying wood in stumps, logs and dead trees. Larvae hatch and feed on decaying wood. Pupal cases of wood debris are formed in the late summer. Adults emerge in the spring. Habitat: Larvae found in sawdust, rotting stumps and compost piles. Adults are found around lights at night and are attracted to rotting fruits and tree sap. Feeding Habits: We had never found adults feeding on plants until talking with a tree grower that had problems and later receiving the photographs shown here. The books say they may feed some on plants, mostly nectar. Larvae feed on and help break down decaying wood and other organic matter. Adults will feed on sap from tree saplings. Economic Importance: Add fascination to nature, help in the decay of organic material and the stimulation of biological activity. Natural Control: Insectivorous animals such as opossums and armadillos love them, especially the giant larvae. Organic Control: None needed usually but when out of control and hurting plant roots or stem tissue, they can be controlled with spinosad products. Insight: The adults are ferocious looking but harmless. Collectors prize the adults, fishermen prize the larvae. Often found in the compost pile, where they are totally beneficial. In Japan, they are kept as pets and sold in stores. Perfect specimens are sold for as much as $3,000. Kept in cages and fed a special diet, they will live up to two years. Ounce for ounce, these giant beetles are among the world's strongest animals. One bug scientist glued weights on a rhinoceros beetle's back and found it could carry up to one hundred times its own weight, although it did get tired. This is comparable to a fifty-year-old man walking a mile with a Cadillac on his back. Rhinoceros beetles, Hercules beetles and Ox beetles. To discuss this newsletter or any other topic, tune in Sunday 8am - 11am central time to the Dirt Doctor Radio Show. The call-in phone number is 1-866-444-3478. Listen on the internet or click here to find a station in your area. Please share this newsletter with everyone in your address book and all your friends on Facebook and Twitter to help me spread the word on organics. to subscribe for Howard Garrett's Free E-Newsletter. click reply and put Unsubscribe in the subject line.